Adventures in the Endless Pursuit of Entertainment: SWEENEY! SWEENEY! SWEENEY! SWEENEY! SWEENEY! SWEENEY! SWEENEY! SWEENEY! SWEENEY! SWEENEY! SWEENEY TODD! 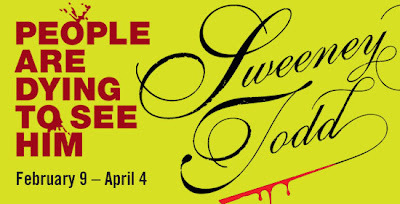 Finally, I'm seeing Sweeney Todd at the Signature Theatre tonight. I've been waiting for over a year! SWEENEY TODD!!!!! I saw Sweeney at Signature a couple of weeks ago and really enjoyed it - I can't wait to read what you think! I'm really anxious to hear what your thoughts were on the production!